The First Lady of the United States is the hostess of the White House. The position is traditionally filled by the wife of the President of the United States, but, on occasion, the title has been applied to women who were not presidents’ wives, such as when the president was a bachelor or widower, or when the wife of the president was unable to fulfill the duties of the First Lady herself. The First Lady is not an elected position; it carries no official duties and receives no salary. Nonetheless, she attends many official ceremonies and functions of state either along with or in place of the president. Traditionally, the First Lady does not hold outside employment while occupying the office. She has her own staff, including the White House Social Secretary, the Chief of Staff, the Press Secretary, the Chief Floral Designer, and the Executive Chef. The Office of the First Lady is also in charge of all social and ceremonial events of the White House, and is a branch of the Executive Office of the President. There have been total of fifty-three First Ladies including forty-two official and eleven acting, within forty-five First Ladyships. This discrepancy exists because some presidents had multiple first ladies. 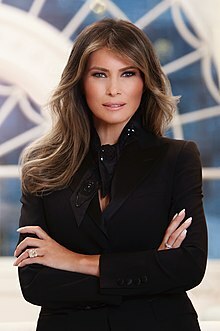 Following Donald Trump's inauguration on January 20, 2017, his wife, Melania Trump, became the 42nd official First Lady, succeeding Michelle Obama, wife of former President Barack Obama. There are four living former First Ladies: Rosalynn Carter, married to Jimmy Carter; Hillary Clinton, married to Bill Clinton; Laura Bush, married to George W. Bush, and Michelle Obama, married to Barack Obama. The first First Lady was Martha Washington, married to George Washington. Presidents John Tyler and Woodrow Wilson had two official First Ladies; both remarried during their presidential tenures. The wives of four Presidents died before their husbands were sworn into office but are still considered First Ladies by the White House and National First Ladies' Library: Martha Wayles Skelton, married to Thomas Jefferson; Rachel Jackson, married to Andrew Jackson; Hannah Van Buren, married to Martin Van Buren; and Ellen Lewis Herndon Arthur, married to Chester A. Arthur. One woman who was not married to a President is still considered an official First Lady: Harriet Lane, niece of bachelor James Buchanan. The other non-spousal relatives who served as White House hostesses are not recognized by the First Ladies' Library. In 2007, the United States Mint began releasing a set of half-ounce $10 gold coins under the First Spouse Program with engravings of portraits of the First Ladies on the obverse. When a President served without a spouse, a gold coin was issued that bears an obverse image emblematic of Liberty as depicted on a circulating coin of that era and a reverse image emblematic of themes of that President's life. This is true for the coins for Thomas Jefferson, Andrew Jackson, Martin Van Buren, and James Buchanan's First Ladies, but not the coin for Chester A. Arthur's First Lady, which instead depicts suffragette Alice Paul. This list included all persons who served as First Ladies, regardless of whether they were married to the incumbent President or not, as well as persons who are considered to have acted as First Lady by the official White House website and the White House Historical Association. Certain spouses of Presidents of the United States are not considered First Ladies of the United States. Thomas Jefferson was married to Martha Wayles from 1772 until her death in 1782. Andrew Jackson was married to Rachel Donelson from 1794 until her death in 1828. Martin Van Buren was married to Hannah Hoes from 1807 until her death in 1819. Chester A. Arthur was married to Ellen Lewis Herndon from 1859 until her death in 1880. Ronald Reagan was married to Jane Wyman from 1940 until 1949. Donald Trump was married to Ivana Zelníčková from 1977 until 1992 and to Marla Maples from 1993 until 1999. Millard Fillmore was married to Caroline Carmichael McIntosh from 1858 until his death in 1874. Benjamin Harrison was married to Mary Scott Lord Dimmick from 1896 until his death in 1901. Theodore Roosevelt was married to Alice Hathaway Lee from 1880 until her death in 1884. He was subsequently married to Edith Carow from 1886 to his death in 1919. ^ Caroli, Betty Boyd (2003). First Ladies from Martha Washington to Laura Bush. Oxford University Press. p. 200. ^ a b "Biography of Martha Jefferson". The White House. Retrieved March 11, 2010. ^ a b "First Lady Biography: Martha Jefferson". National First Ladies' Library. Retrieved March 11, 2010. ^ "Biography of Rachel Jackson". The White House. Retrieved March 11, 2010. ^ "First Lady Biography: Rachel Jackson". National First Ladies' Library. Retrieved March 11, 2010. ^ a b "Biography of Hannah Van Buren". The White House. Retrieved March 11, 2010. ^ a b "First Lady Biography: Hannah Van Buren". National First Ladies' Library. Retrieved March 11, 2010. ^ "Biography of Ellen Arthur". The White House. Retrieved January 20, 2009. ^ "First Lady Biography: Ellen Arthur". National First Ladies' Library. Retrieved January 10, 2009. ^ "The First Spouse Gold Coins". United States Mint. Retrieved January 10, 2009. ^ 31 U.S.C. § 5112(o)(3)(D)(i)(II) Denominations, specifications, and design of coins. The First Spouse Gold Coins. Cornell University. Retrieved on January 10, 2009. ^ "Biography of Martha Washington". The White House. Retrieved March 11, 2010. ^ "First Lady Biography: Martha Washington". National First Ladies' Library. Retrieved March 11, 2010. ^ "Biography of Abigail Adams". The White House. Retrieved March 11, 2010. ^ "First Lady Biography: Abigail Adams". National First Ladies' Library. Retrieved March 11, 2010. ^ Jefferson's spouse, Martha Jefferson, died before he became President. Their daughter, Martha, is considered de facto First Lady by the White House Historical Association. ^ "Biography of Dolley Madison". The White House. Retrieved March 11, 2010. ^ "First Lady Biography: Dolley Madison". National First Ladies' Library. Retrieved March 11, 2010. ^ "Biography of Elizabeth Monroe". The White House. Retrieved March 11, 2010. ^ "First Lady Biography: Elizabeth Monroe". National First Ladies' Library. Retrieved March 11, 2010. ^ "Biography of Louisa Adams". The White House. Retrieved March 11, 2010. ^ "First Lady Biography: Louisa Adams". National First Ladies' Library. Retrieved March 11, 2010. ^ "Emily Donelson". WHHA. Retrieved 2017-06-01. ^ "First Ladies Never Married to Presidents: Sarah Jackson". www.firstladies.org. Retrieved 2017-06-01. ^ "Biography of Anna Harrison". The White House. Retrieved March 11, 2010. ^ a b "First Lady Biography: Anna Harrison". National First Ladies' Library. Retrieved March 11, 2010. ^ "Biography of Letitia Tyler". The White House. Retrieved March 11, 2010. ^ "First Lady Biography: Letitia Tyler". National First Ladies' Library. Retrieved March 11, 2010. ^ "Letitia Tyler Biography :: National First Ladies' Library". Firstladies.org. December 28, 1907. Retrieved September 7, 2016. ^ "Biography of Julia Tyler". The White House. Retrieved March 11, 2010. ^ "First Lady Biography: Julia Tyler". National First Ladies' Library. Retrieved March 11, 2010. ^ "Biography of Sarah Polk". The White House. Retrieved March 11, 2010. ^ "First Lady Biography: Sarah Polk". National First Ladies' Library. Retrieved March 11, 2010. ^ "Biography of Margaret Taylor". The White House. Retrieved March 11, 2010. ^ "First Lady Biography: Margaret Taylor". National First Ladies' Library. Retrieved March 11, 2010. ^ "Biography of Abigail Fillmore". The White House. Retrieved March 11, 2010. ^ "First Lady Biography: Abigail Fillmore". National First Ladies' Library. Retrieved March 11, 2010. ^ "Biography of Jane Pierce". The White House. Retrieved March 11, 2010. ^ "First Lady Biography: Jane Pierce". National First Ladies' Library. Retrieved March 11, 2010. ^ "Biography of Harriet Lane". The White House. Retrieved March 11, 2010. ^ "First Lady Biography: Harriet Lane". National First Ladies' Library. Retrieved March 11, 2010. ^ "Biography of Mary Lincoln". The White House. Retrieved March 11, 2010. ^ "First Lady Biography: Mary Lincoln". National First Ladies' Library. Retrieved March 11, 2010. ^ "Biography of Eliza McCardle Johnson". The White House. Retrieved March 11, 2010. ^ "First Lady Biography: Eliza Johnson". National First Ladies' Library. Retrieved March 11, 2010. ^ "Biography of Julia Grant". The White House. Retrieved March 11, 2010. ^ "First Lady Biography: Julia Grant". National First Ladies' Library. Retrieved March 11, 2010. ^ "Biography of Lucy Hayes". The White House. Retrieved March 11, 2010. ^ "First Lady Biography: Lucy Hayes". National First Ladies' Library. Retrieved March 11, 2010. ^ "Biography of Lucretia Garfield". The White House. Retrieved March 11, 2010. ^ "First Lady Biography: Lucretia Garfield". National First Ladies' Library. Retrieved March 11, 2010. ^ "Mary Arthur McElroy, White House hostess for President Chester Arthur". loc.gov. Library of Congress. Retrieved 2 May 2017. Wilson, J. G.; Fiske, J., eds. (1900). "Cleveland, Grover" . Appletons' Cyclopædia of American Biography. New York: D. Appleton. ^ a b "Biography of Frances Cleveland". The White House. Retrieved March 11, 2010. ^ a b "First Lady Biography: Frances Cleveland". National First Ladies' Library. Retrieved March 11, 2010. ^ "Biography of Caroline Harrison". The White House. Retrieved March 11, 2010. ^ a b "First Lady Biography: Caroline Harrison". National First Ladies' Library. Retrieved March 11, 2010. ^ "Biography of Ida McKinley". The White House. Retrieved March 11, 2010. ^ "First Lady Biography: Ida McKinley". National First Ladies' Library. Retrieved March 11, 2010. ^ "Biography of Edith Roosevelt". The White House. Retrieved March 11, 2010. ^ "First Lady Biography: Edith Roosevelt". National First Ladies' Library. Retrieved March 11, 2010. ^ "Biography of Helen Taft". The White House. Retrieved March 11, 2010. ^ "First Lady Biography: Helen Taft". National First Ladies' Library. Retrieved March 11, 2010. ^ "Biography of Ellen Wilson". The White House. Retrieved March 11, 2010. ^ a b "First Lady Biography: Ellen Wilson". National First Ladies' Library. Retrieved March 11, 2010. ^ "Biography of Edith Wilson". The White House. Retrieved March 11, 2010. ^ "First Lady Biography: Edith Wilson". National First Ladies' Library. Retrieved March 11, 2010. ^ "Biography of Florence Harding". The White House. Retrieved March 11, 2010. ^ "First Lady Biography: Florence Harding". National First Ladies' Library. Retrieved March 11, 2010. ^ "Biography of Grace Coolidge". The White House. Retrieved March 11, 2010. ^ "First Lady Biography: Grace Coolidge". National First Ladies' Library. Retrieved March 11, 2010. ^ "Biography of Lou Hoover". The White House. Retrieved March 11, 2010. ^ "First Lady Biography: Lou Hoover". National First Ladies' Library. Retrieved March 11, 2010. ^ "Biography of Eleanor Roosevelt". The White House. Retrieved March 11, 2010. ^ "First Lady Biography: Eleanor Roosevelt". National First Ladies' Library. Retrieved March 11, 2010. ^ "Biography of Bess Truman". The White House. Retrieved March 11, 2010. ^ "First Lady Biography: Bess Truman". National First Ladies' Library. Retrieved March 11, 2010. ^ "Biography of Mamie Eisenhower". The White House. Retrieved March 11, 2010. ^ "First Lady Biography: Mamie Eisenhower". National First Ladies' Library. Retrieved March 11, 2010. ^ "Biography of Jacqueline Kennedy". The White House. Retrieved March 11, 2010. ^ "First Lady Biography: Jackie Kennedy". National First Ladies' Library. Retrieved March 11, 2010. ^ "Biography of Lady Bird Johnson". The White House. Retrieved March 11, 2010. ^ "First Lady Biography: Lady Bird Johnson". National First Ladies' Library. Retrieved March 11, 2010. ^ "Biography of Pat Nixon". The White House. Retrieved March 11, 2010. ^ "First Lady Biography: Pat Nixon". National First Ladies' Library. Retrieved March 11, 2010. ^ "Biography of Betty Ford". The White House. Retrieved March 11, 2010. ^ "First Lady Biography: Betty Ford". National First Ladies' Library. Retrieved March 11, 2010. ^ "Biography of Rosalynn Carter". The White House. Retrieved March 11, 2010. ^ "First Lady Biography: Rosalynn Carter". National First Ladies' Library. Retrieved March 11, 2010. ^ "Biography of Nancy Reagan". The White House. Retrieved March 11, 2010. ^ "First Lady Biography: Nancy Reagan". National First Ladies' Library. Retrieved March 11, 2010. ^ "Biography of Barbara Bush". The White House. Retrieved March 11, 2010. ^ "First Lady Biography: Barbara Bush". National First Ladies' Library. Archived from the original on March 3, 2009. Retrieved March 11, 2010. ^ "Biography of Hillary Clinton". The White House. Retrieved March 11, 2010. ^ "First Lady Biography: Hillary Clinton". National First Ladies' Library. Retrieved March 11, 2010. ^ "Biography of Laura Bush". The White House. Retrieved March 11, 2010. ^ "First Lady Biography: Laura Bush". National First Ladies' Library. Retrieved March 11, 2010. ^ "Biography of Michelle Obama". The White House. Retrieved March 11, 2010. ^ "First Lady Biography: Michelle Obama". National First Ladies' Library. Retrieved March 11, 2010. ^ "Who Is Melania Trump?". New York, N.Y.: The New Yorker. Retrieved May 9, 2016.